Paris Weekender - Updated Restaurant Guides! It’s that time again – time to share my latest Paris food & drink finds. Below are the latest bars and restaurants that I have added to my guides. As always, “**” signifies some of my real favorites. 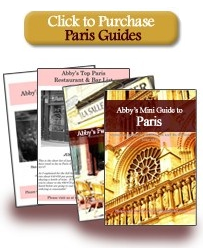 Purchase the updated print-ready PDFs of my bar and restaurant guides, as well as my Mini Guide to Paris here. L’absinthe (1st) 24, Place Marché St Honoré, Tel. 01 49 26 90 04. Located in the lively Place Marché St Honoré, this restaurant offers friendly service and a mix of traditional and modern cuisine in a traditional setting. Outdoor seating also available. Reflets de Scène (1st) 22 Rue de Beaujolais, Tel. 01 42 97 51 57. Wonderful location just steps from the Jardin du Palais Royal, friendly and efficient service (they are used to pre-theater diners). A good selection of traditional French and more modern, innovative cuisine. Open every day (but closed Monday dinner and Saturday lunch). BioBoa Cafe (2nd) 93, rue Montmartre, Tel. 01 40 28 02 83, contact@bioboa.fr. This organic food café offers a mix of lighter fare and heartier plates. A good spot for a long weekend brunch. La Maison de l’Amerique Latine (7th) 217, bd St-Germain, Tel. 01 49 54 75 10, Mon – Fri only. The food is good but the setting in magnificent. Be sure to pick a warm summer evening and sit on the outdoor terrace. Don’t leave without taking a spin around the garden first. **Musée Jacquemart-André (8th) 158 bd Haussmann, Tel. 01 45 62 11 59, Mon-Sun 11h45-17h30. The magnificent dining room with a beautiful terrace for outdoor dining would make this restaurant worthwhile, but the food is also surprisingly good. They offer just one hot meal and one quiche option each day but also about 10 different salads (including quinoa and pasta salads) that are innovative and flavorful. The desert cart is also impressive. Special brunch menu on weekends. They do not take reservations. Cafe Tolo (Basque) (11th), 3 Rue Eugène Varlin, Tel. 01 42 05 22 51. This little restaurant just off the Canal Saint Martin with its ecclectic furnishings serves flavorful Basque cuisine at surprisingly reasonable prices. Excellent wine as well. **Olio Pane Vino (1st) 44, rue Coquillière, Tel: 01 42 85 27 33, Mon–Sat, lunch; dinner on Thurs and Fri only. This cozy and friendly spot has a small selection but everything is fresh and prepared to perfection. Surprisingly good value for your money. Al Taglio (3rd) 27, rue Saintonge, Tel: 09 50 48 84 06. A wide variety of creative pizzas, pay by the weight. Open daily, Noon-11pm, and other locations. Restaurant La Briciola (3rd) 64, rue Charlot, Tel. 01 42 77 34 10. Very friendly and lively restaurant specializing in pizza, though they do have some other dishes too. Pink Flamingo Pizza (3rd) 105 Rue Vieille du Temple (and other locations), Tel. 01 42 71 28 20. Innovative pizzas as well as the old classics. Eat in the small and trendy restaurant or take away. **L’Alimentari (4th) 6 rue des Ecouffes, 75004, Hours: Lunch and dinner, Monday-Saturday; closed Sunday, Tel. 01 42 77 24 59. Cozy atmosphere under centuries-old exposed beams. Fresh and authentic Italian food. The burrata and linguine alle vongole (clams) were especially delicious. Quartino (4th) 19-20, rue Rambuteau 75004 Paris, Tel. 01 44 78 10 24. Deliciously fresh pizza by the slice (pay by weight). Open every day 11h – 22h. **Au Petit Thai (4th) 4 rue roi de Sicile, Tel. 01 42 72 75 75. In a traditional 17th century house, cozy but at the same time lively atmosphere. The food had more of a kick, more flavor than most Thai restaurants. Excellent wine and cocktail list, friendly neighborhood feel. **Asianwok (11th) 63 rue Oberkampf, Tel. 01 43 57 63 24 / Mobile 06 29 27 10 48. Closed Sundays. You would never suspect that this little restaurant out in the 11th would have such incredible and authentic Asian food. Thai food is the specialty of the warm and friendly owner, Cédric Ung. You can’t go wrong if you ask him to pick your dishes for you. But my favorite item is not the food at all. It’s their secret recipe tea-infused champagne. **Schwartz’s Deli (4th) 16 Rue des Ecouffes (and other locations), Tel. 01 48 87 31 29. Open Tuesday 12h–15h, 19h30-23h. American deli favorites done right: pastrami sandwiches, mac n’ cheese, burgers, cheesecake. They don’t take reservations. **Big Fernand (9th) 55 rue du Faubourg Poissonnière, Tel. 01 47 70 54 72, Open Mon – Sat 12h – 14h30 and 19h – 22h30. Probably the best burgers in Paris; possibly the best burgers anywhere. Pick one of their classics or build your own burger (beef, chicken or veal). Don’t be scared off by the line – it moves quickly. **Pitzman (4th) 8 Rue Pavée, Tel. 01 42 71 17 17. Slightly more traditional than L’As du Falafel. Excellent falafel at only €5.50 to go or €6.50 eating in. Various other kosher dishes as well. **Azabu (6th) 3 Rue André Mazet , Tel. 01 46 33 72 05. More than a meal, it’s an experience. I recommend going with just one other person and sitting at the bar so you can see the chefs preparing the meals. You must reserve in advance. It’s not cheap but the food is incredible and copious. **Les jardins de Takako (17th) 9 Rue Brey. 01 53 81 77 40. My new favorite lunch spot. There are only 3 tables with 4 seats each. Fresh sushi dishes and cooked mains as well. Their signature miso eggplant side dish is addictive. Very friendly atmosphere. Nakamura (17th) 25 Rue Brey, Tel. 01 40 55 96 72. A tiny, family-run authentic Japanese restaurant tucked away near Etoile. Excellent Japanese curries. **Guilo Guilo (18th) 8 Rue Garreau, Tel. 01 42 54 23 92. You must reserve far in advance for this authentic Japanese eating experience. Everyone sits at the counter here (so best to go with smaller groups), and the menu is fixed. It’s pricey but well worth it. You will not go home hungry. The restaurant staff has an amazing process of feeding everyone efficiently with minimal food prep space. And they certainly make you feel welcome. **Maison Marais (4th) 3 Rue Ferdinand Duval, Tel. 01 48 87 28 15. Cozy and right across the street. Excellent bibimbap in a warm stone bowl, reasonable prices. Chez Ly (8th) 25 rue de la Boetie, Te. 01 42 65 42 99, (and other locations). It’s hard to find good Chinese food in Paris. Still not on par with most Chinese food in the U.S. or UK, but it will definitely hit the spot if you are craving Chinese food. Clasico Argentino – Empanadas & Helado (3rd) 56 rue de Saintonge and other locations, Tel. 01 44 61 00 56. Great for a snack or a light lunch. 35 Tours (2nd) 35 rue Saint Sauveur, Monday to Saturday: 18h30 – 2h. A refreshingly quiet bar for the heart of Montorguiel. Very friendly service. **Le Barav (3rd) 6 Rue Charles-François Dupuis, Tel. 01 48 04 57 59. My favorite new wine bar: run next door to buy a bottle of wine from their shop and for €5 more, they will open the bottle for you in the bar. They serve food as well (including excellent salads). Alimentation Générale (11th) 64 Rue Jean-Pierre Timbaud, Tel. 01 43 55 42 50. Live music Wednesday through Sunday nights, casual atmosphere. Food served as well.